Find Out How to Make the Most of Your Outdoor Spaces! Use COLOR. Adirondack styles of furniture can be finished in a wide variety of colors. Made of pressure treated solid pine from renewable resources, chairs and tables boast a limited lifetime warrantee against rot, insect infestation and water damage. Adirondack styles are eco-friendly, charming and comfortable. 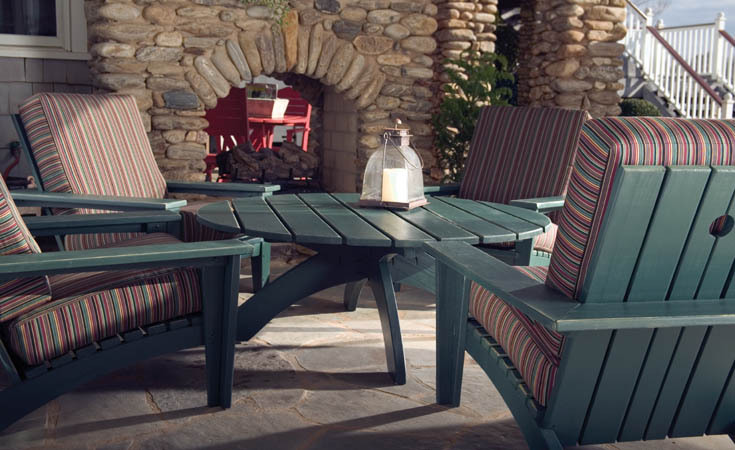 Consumers will find it easy to enjoy long stretches of outdoor time nested in Adirondack-style seating. Make it PERSONAL or inspirational. Metal outdoor benches and seating can be easily customized with a logo or favorite inspirational quote or saying. These solid steel seating options with durable thermoplastic coatings are great tools to encourage consumers and guests to just sit down and take in the sights and sounds of nature. Benches can easily be surface or ground mounted along walking paths or sidewalks. Fully weather-proof and corrosion-proof, metal options retain their color and form for decades with no maintenance. Be GREEN. Recycled plastic plank seating has the look of natural wood but never needs staining or refinishing. The planks are durable and weather-proof with wood detailing that mimics wood plank benches. The natural coloring of the planks blends perfectly in any outdoor space to create a soft, natural look without ever needing maintenance. Make it DINING READY. Even if you have a short warm season, outdoor tables and chairs draw people outside to enjoy snacks and meals that lead to productive dialogue. There is something satisfying and rewarding about dining outside. Even if your space is small, an appropriately sized table with seating will be used and appreciated. Options include metal with attached bench seating (including ADA Compliant configurations), wood with bench seating or chairs, or portable molded plastic and polyurethane tables with folding seats. Make it COZY. Organizing a small group therapy session or meeting in a vast outdoor space can be made easier with a well-planned furniture arrangement. Think of it like an outdoor living room – orient pieces towards a focal point like a fireplace, flower garden, planter, etc. to create an area that encourages group dynamics and allows for easy conversation. Adirondack occasional tables and sofas and chairs with cushions are the best options for creating outdoor living rooms where consumers and staff feel safe, comfortable and at ease with their natural surroundings. Remember that when furnishing an outdoor space, buying contract outdoor furniture is the best way to ensure you buy pieces that are constructed to commercial standards. You will have peace of mind that your furniture will have the right construction standards, warranties and durability to last over time.